Warpaint’s debut album, 2010’s The Fool, sounded at times like it was recorded in a dripping rainforest, from the sticky echoes on “Bees” to the slowly cranked-up pace of “Composure.” A little over three years later, the all-female quartet has slowed down even further, and thrown a bucket of ice water on the atmospherics, to both the benefit and detriment of its self-titled second album. The band still sounds too structured to be called drone and too artfully arranged to be punk, but draws from both those genres—along with strains of funk and R&B—on the first half of the record, which boasts its share of supremely cool grooves. 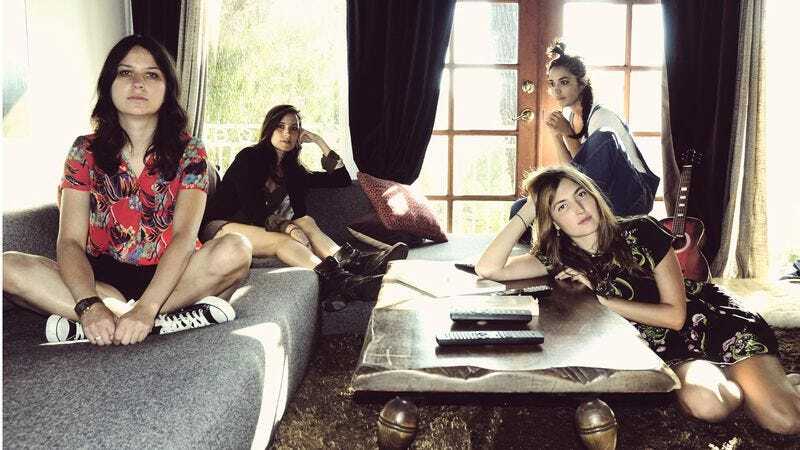 The first 10 minutes of Warpaint—an instrumental intro followed by “Keep It Healthy” and “Love Is To Die”—form the catchiest, most engrossing stretch of the band’s career. Bassist Jenny Lee Lindberg and drummer Stella Mozgawa provide a solid anchor at the bottom end, a foundation from which spring lilting, hypnotic guitar lines. The lyrics Emily Kokal and Theresa Wayman sing rarely make much sense, instead imparting a perfectly confusing and lightly thoughtful tone while soaring above the rhythm section. Unfortunately, Warpaint is frontloaded, and the back half slips by without many notable moments. “Disco//Very” disrupts the flow with a grating vocal line that rumbles in place of the guitars. And while songs like “Biggy” and “Teese” blend together in seamless bliss, “Feeling Alright” and “CC” are marred by more discordant noise. The languid movement between the two sounds on the first half suggests Warpaint is more adept at creating something alluring out of spacey and disorganized threads instead of honing in on more disruptive, droning elements. That’s why “Hi”—with its coy vocals and understated yet lively instrumentation—works better than the dirge-like “Go In,” which feels too similar to the tracks on The Fool that mimicked Joy Division’s Closer. If Savages’ Silence Yourself, which yelps and flies, lives in the message-driven post-punk fast lane, then Warpaint is over on the other side of the same road. The band takes a more laid-back, mood-first approach to the genre while also including spacy, exploratory touches. Warpaint is a slicker, more relaxed outing from an already comfortable band that has been playing together for a decade. But it fades down the stretch, dulling the focus and strength of the first six songs and, ultimately, the whole record.